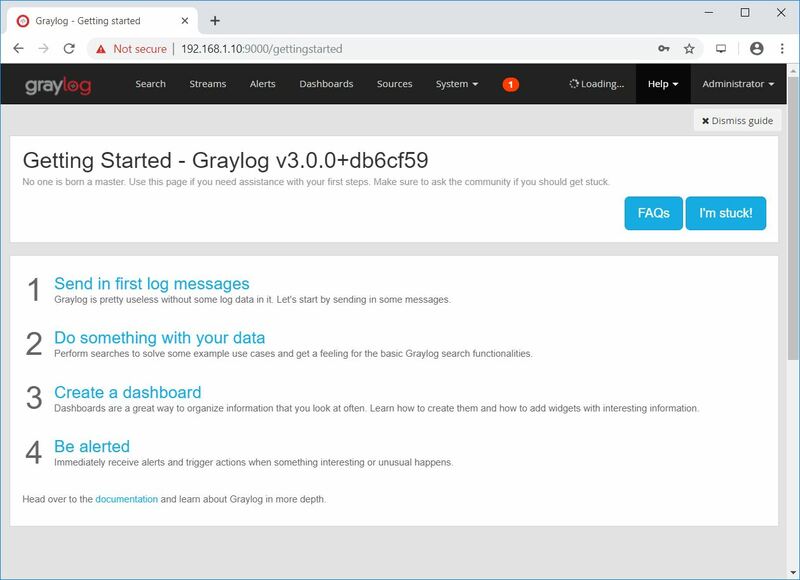 Graylog is a free, open-source log management tool which helps you to collect and analyze any machine logs centrally. This guide focuses on installing Graylog 3.0 on Debian 9. Elasticsearch – It stores the machine logs and provides the searching facility. MongoDB – Acts as a database to store configurations and meta information. Graylog server – t collects the logs from various inputs and provides built-in Web Interface for managing the logs. Install the few required packages for the Graylog setup. Install either Oracle JDK or OpenJDK on your machine for Elasticsearch. Elasticsearch is one of the main component in Graylog set up. It acts as a search server, offers a real-time distributed search and analytics with the RESTful web interface. Elasticsearch stores the logs sent by the Graylog server and displays the messages whenever user request over the built-in web interface. Let’s add the Elasticsearch GPG signing key. 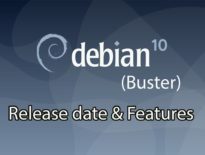 Configure Eleasticsearch repository by running below command. Update repository cache and install Elasticsearch. Set Elasticsearch to start automatically on the system startup. Edit configuration file of Elasticsearch. Set the cluster name as graylog. Wait for a minute to let the Elasticsearch get fully started. Elastisearch should be now listening on port 9200 for serving HTTP request, use a CURL to check the response. Ensure that cluster name shows as graylog. Check the health of the Elasticsearch cluster. Make sure the cluster status is green. Import the MongoDB’s public key to your system. Add mongodb repository to your system by creating the /etc/apt/sources.list.d/mongodb-org.list file using the following command. Start the MongoDB service and enable it in the start-up. 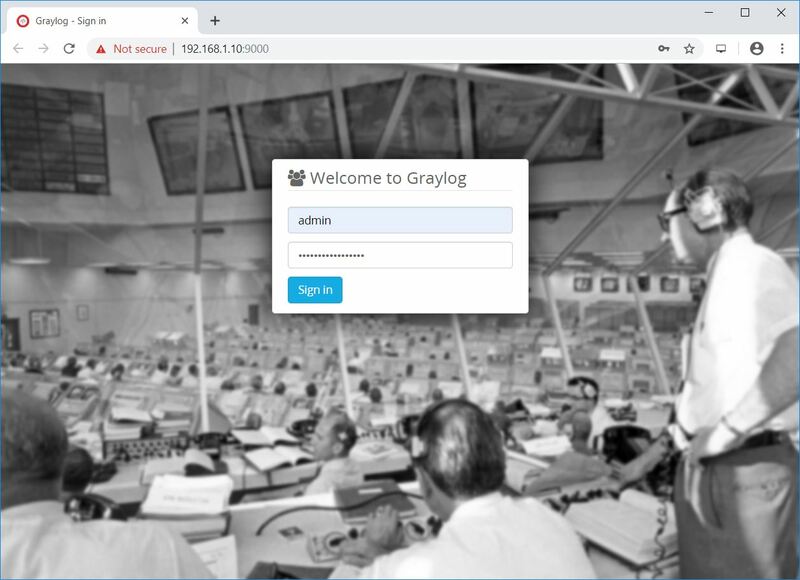 Graylog server accepts and processes the machine logs and displays them for requests that come from the graylog web interface. Download and Install graylog 3.x repository. Install the Graylog server using the apt command. Set a secret to secure user passwords. Use the pwgen command to the same. Place the secret like below. Set a hash (sha256) password for Graylog’s root user (Root user of graylog is admin). Graylog admin’s password can’t be changed using web interface; you must edit this variable to set it. Replace yourpassword with the choice of yours. You will want this password to login into the Graylog web interface. Set up an email address for the Graylog admin user. Set the master node by defining the below variable. The default setting is true. If you add a second Graylog server, set this setting to false to make the node as a slave. Shards setting rely on the number of Elastic nodes in an Elasticsearch cluster. If you have only one Elastic node, set it as 1. This setting sets the number of replicas for indices. If you have only one Elasticsearch node in the cluster, set it as 0. Modify the below entries to enable Graylog Web Interface. Enable Graylog server to start automatically on system boot. Check out the server startup logs to troubleshoot the Graylog in case of an issue. Upon the successful start of the Graylog server, you should get the following message in the log file. 2019-03-21T23:44:58.285-04:00 INFO  [ServerBootstrap] Graylog server up and running. The Graylog web interface will now be available on port 9000. So, point your browser to. 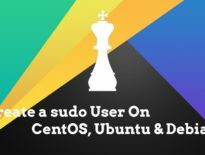 Login with username admin and the password you configured on server.conf. Once you logged in, you should see the Graylog’s getting started page. Click on System >> Overview to check the status of the Graylog server. You have successfully installed Graylog Graylog 3.0 on Debian 9. 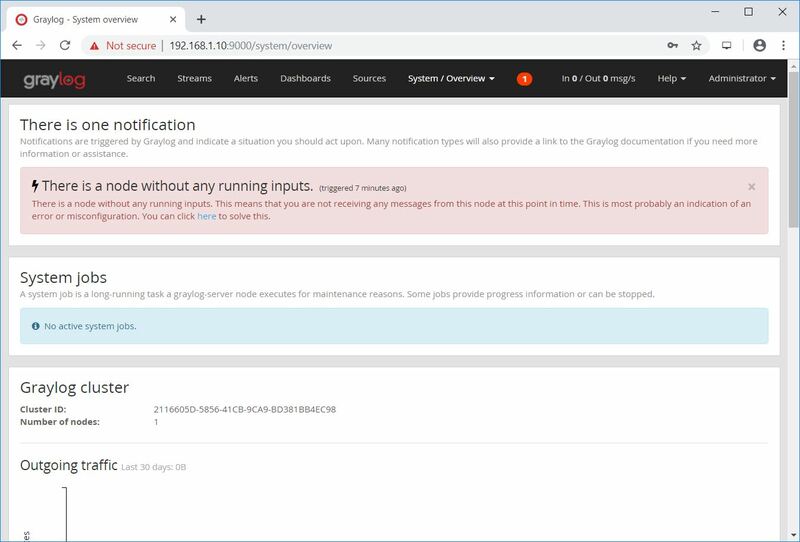 To receive logs from other machines, you would need to configure Graylog inputs and have to configure Linux machine to send logs to Graylog.